Glenn Irwin set the fastest time in free practice at Brands Hatch on the PBM Be Wiser Ducati on Friday. Glenn Irwin placed himself at the top of the Bennetts British Superbike summit in free practice at Brands Hatch on Friday. The Carrick man is having his final outing for the PBM Be Wiser Ducati team at this weekend’s triple-header Showdown finale at the Kent circuit, where race one takes place on Saturday afternoon (16:00 BST). Tyco BMW's Keith Farmer led the times in the Pirelli National Superstock 1000 class at Brands Hatch. 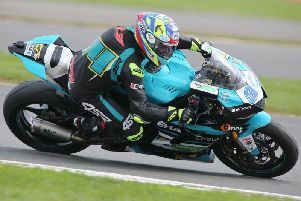 Irwin set his best lap in FP2 in 1m 25.233s, which put the 28-year-old only 0.007 seconds ahead of Jake Dixon (RAF Reserves Kawasaki), with Aussie Josh Brookes – a double winner at the Brands GP circuit in July – third fastest on the McAMS Yamaha, only 0.110 seconds down on Irwin. Northern Ireland rider Irwin is chasing his maiden BSB victory of the season and is determined to sign off with a win as he bids to clinch third place overall in the final Showdown classification. He twice finished as the runner-up behind Brookes in July at Brands after two close races between the pair. Irwin will join the JG Speedfit Kawasaki team for 2019, replacing Leon Haslam, who is switching to World Superbikes in the Kawasaki team alongside Jonathan Rea. Haslam, who is a red-hot favourite to win the title this weekend, was sixth fastest. Irwin’s younger brother, Andrew, was 11th in FP2. The 24-year-old is also having his final ride for Paul Bird’s Ducati team, with MotoGP rider Scott Redding and 2015 BSB champion Brookes confirmed for 2019 on the Ducati V4. Tyco BMW’s Michael Laverty was 16th quickest, 1.4 seconds down on Irwin. Meanwhile, Co. Tyrone’s Keith Farmer made a strong start to his quest for a fourth British title as he set the pace in the Pirelli National Superstock 1000 class. Farmer led the times in FP2 by 0.149 seconds from Joe Collier (EHA Aprilia). His nearest rival, Buildbase Suzuki’s Billy McConnell, was right in the mix in third, 0.022s behind Collier. Farmer holds a lead of 10.5 points over the Australian ahead of Sunday's final race (13:35 BST). Dublin’s Jack Kennedy was fastest in Supersport practice on the Integro Yamaha by 0.2 seconds from Gearlink Kawasaki’s Ben Currie, with Alastair Seeley third quickest on the EHA Yamaha. Kennedy leads the title race by 41 points from Currie. The Sprint race takes place today (16:45 BST). Aghadowey’s Eunan McGlinchey was third fastest in the Junior Supersport class. The 20-year-old only needs a top seven finish to win the title in today’s race (15:15 BST).